Why a Church Records Project? Download this article as a PDFWhen our earliest Ukrainian ancestors set foot on North American soil, they brought their religious faith to sustain them in a strange land. In every community in which Ukrainians settled in North America, one of the first things they did was to organize church communities, and the records of those churches contain a wealth of information about these pioneers. Many people do not realize that in the United States the government did not begin keeping regular civil records of births, marriages, and deaths until well into the 20th century. And when they did, the civil registrars often badly mangled the names of “foreigners”, including Ukrainian Americans. Church records, therefore, are a much more reliable source of information about early Ukrainian families and their origins, providing information that may not be available anywhere else. But there is another level of importance to this project. The church records themselves, although they appear to be mostly lists of names and dates, or the minutes of boring parish board meetings, they in fact chronicle the history of Ukrainian community culture in North America. By turning these documents into computer-readable data, historians will be able to apply emerging technologies in the “digital humanities” to the comings and goings of priests, the language employed to write the records themselves, changes in congregational affiliations, and even the movement of individual families from parish to parish because of employment shifts or religious differences. This will help to unlock unknown, undocumented, and forgotten aspects of Ukrainian American history. Having parish records available in a central location where they can be searched and analyzed will enable us to rediscover and advance our history as never before. Why are we proposing this project now? Thanks to the Internet, we now have a growing community of people who are interested in preserving and promoting our Ukrainian heritage. Working together we can accomplish much more than any one of us could alone. But most importantly, time is not on our side. We need only recall Woonsocket, Rhode Island; Philadelphia, Pennsylvania; and, most recently, Carteret, New Jersey, to realize how fragile our history is. In the course of an afternoon or a few hours overnight, it could literally go up in smoke. Making digital “backup copies” of these records now will help to ensure that the information they contain will be available for many future generations to study and to appreciate their Ukrainian American heritage. The organizing committee of “Nashi Predky” has developed a methodology to efficiently digitize the historical records of our parishes. Our committee includes a professional archivist, a professional genealogist, individuals with a long tenure of service to the Church, and individuals who have a passionate interest in preserving and promoting Ukrainian American heritage. Together, we have drawn upon our diverse experiences and backgrounds to come up with an simple and efficient approach to preserve these records and make them more accessible. The vast majority of our Church’s historical records are maintained at the parish level. Only the records of a few closed parishes are in the Archives of the Ukrainian History and Education Center, and the UOC of USA Consistory maintains a database only of relatively recent sacramental records. In most cases, the parish metrical books, books of meeting minutes, early photographs, and other documents located in our church offices and rectories are the only copy of those records in existence. The need for parish participation is therefore crucial. If you are interested in helping to preserve the records from your parish, please contact us at genealogy@ukrhec.org, and we will work with you to ensure that the project is a success. Anyone with a good, recent model digital camera can participate! A team of two people per record book is best; one to photograph and the other to steady or turn the pages. You will also need a clean, well lit room: direct sunlight is not good, as is mixed lighting (e.g. rooms with both fluorescent lights and daylight from a window), as that will cause problems with subsequent color balancing. There should be sufficient clear table space to handle the records without risking damage. A tripod is highly recommended but is not essential. Although flatbed scanners or copy machines can produce higher quality images, they can also severely damage the fragile spines of old record books. Digital photography is much gentler on the materials, and it even eliminates the need to remove them from the church or rectory! Parishes could organize a “photographing party” where several individuals get together and each group of two individuals photographs a book. The work will likely go very quickly, and you will be amazed at how clear the photographs will be. Modern digital cameras are very powerful and the more mega-pixels that your camera has, the clearer the image will be. You do not have to be an expert in digital photography or image processing software! In fact, we would prefer that you don’t do any color correction, cropping, or other image adjustments yourself. You can simply mail us the SD card straight from your camera (or upload the files to a secure online “lock box”, if your ISP’s upload speed is fast enough). An SD card is inexpensive to purchase, but if you would like it returned after we have downloaded the images, we would be happy to mail it back to you. If you are interested in organizing such an effort at your parish, please contact us before you start (genealogy@UkrHEC.org). This is important for three reasons. First of all, it will help us to plan for storage space and recruit an appropriate number of volunteer transcribers (see below). Secondly, we can provide you with technical advice and make sure that your images are of sufficient quality for effective transcription. Finally, we will provide you with photo log forms to help you document your work so that your images can be correctly identified and put in the proper order. Once the Center receives your digital images, they will be downloaded to a central computer at the Center. The Nashi Predky team will systematically tag every file with identifying and descriptive information (“metadata”) from your log forms. This will allow us (and any archivists and researchers decades into the future) to keep track of which parish’s records the images represent, information about the original item, when and by whom the pictures were taken, and the relationship between the files and the original objects (such as the details of page sequence, and whether some of the images represent close-up views). All files will be digitally preserved using current archival best practices, including the original images exactly as they came off of the camera, as well as any derivative images that we will create (such as for color correction and watermarking, see blow). Files will be stored on a RAID redundant disk array, and will be regularly backed up to external hard drives (one of which will be stored off-site) as well as to a secure cloud storage provider in order to prevent all of this hard work from being lost in the event of computer hardware failure or disaster. The strength of the Nashi Predky group will become evident as the records are transcribed. We have over 1,000 members in our international online community. Many of them have been quite generous with their time and resources and we expect that they will be happy to help transcribe the submitted parish records. Many of our members are fluent in English, Ukrainian, Russian, Latin, and other relevant languages, as well as being familiar with old styles of handwriting, enabling the transcription and translation to be done with considerable accuracy. The first stage will involve transcription of the records into separate Excel spreadsheets. 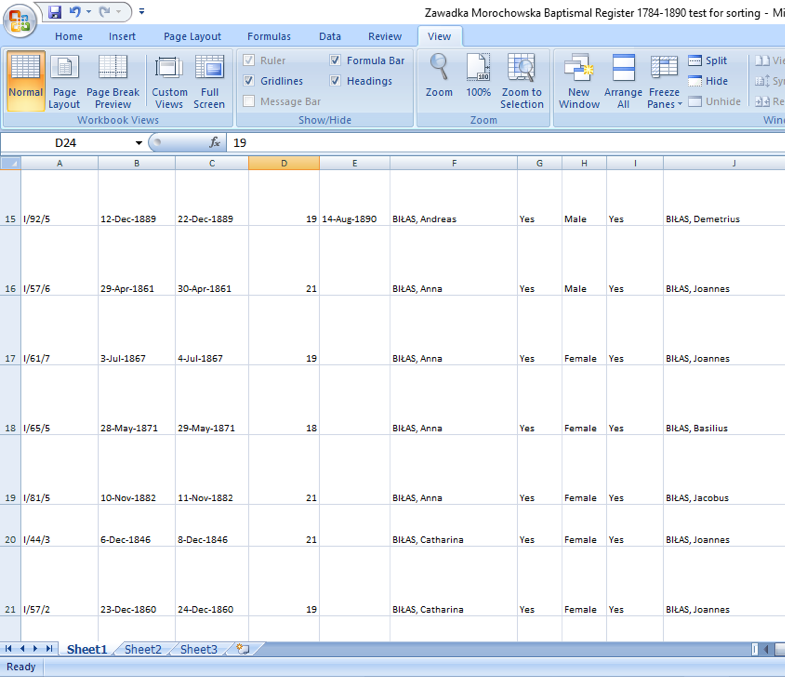 The data will be input from the original record books into sortable fields. Thus, it will be very easy to sort baptismal, marriage, and burial records based upon any category contained in the original record. It will be easy to determine, for example, all children who shared a certain godparent; all children of a certain couple; all instances of a certain surname or home village in a parish; or even all children born in a particular month or persons who died on a certain date. The ramifications of this ability for historical and genealogical research are tremendous. As more and more parishes are transcribed, it will be possible to search for persons who moved from place to place and to understand historical facts that have long been lost or obscured. Once a critical mass of records has been obtained, we will combine the record sets into a single searchable database that will have all of the data fields of the original record, as well as a source column that will identify the parish and book from which the data originated. Initially, the primary focus will be upon transcribing the parish metrical books (baptisms, weddings, and funerals). But other parish records, such as board meeting minutes, memoranda, old photographs, cemetery lot records, and so forth, are of considerable historical importance, and we hope to index those records in the second stage of the project. But submitting images of these items now will serve as an “insurance policy” against loss of that valuable information to fire, flood, or other disaster. Obviously, these records are only valuable to the extent that people can find them and access the information contained in them. However, there are three competing considerations that must be taken into account: (1) ease of access to records by researchers, (2) privacy concerns, and (3) financial concerns. Any project of this magnitude should strike a reasonable balance between them, and we believe that our proposal does this. First, we are interested in obtaining digital photographs for the Center of all records which any parish cares to share with us. Each parish can decide which records it is prepared to share. We will take steps to minimize the danger from identity theft and other “data crime”, while ensuring that researchers will still have meaningful access to these valuable historical records. We will do this by keeping the digital images themselves accessible only on-site and only upon specific request. Two indices with different levels of detail will be created. The “on-site index” will be a full extract of the data in the records, and will include all of the names (including those of witnesses and godparents), dates, and places which appear in the original documents. This version of the index will be searchable and sortable on any field, but will be accessible only via computers physically located at the Center. An abridged “online index” will be placed on the History and Education Center/Nashi Predky website and will contain only a summary of the data from the records - for baptismal records it will include the name of the child, the names of parents, the year of the event, and the parish in which it was recorded; for marriage records it will include the names of the parties, the year of the event, and the parish in which it was recorded; and for burial records it will include the name of the deceased, the date of the event, and the parish in which it was recorded. 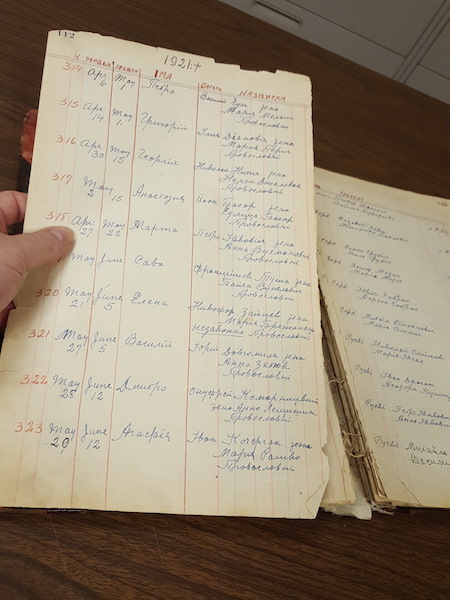 Furthermore, the online index will include only births older than 100 years and marriages older than 50 years (the on-site index will, of course, include all of the transcribed records which the parishes have allowed us to digitize). Thus, anybody who wants to obtain parish records for identification purposes will still be required to directly contact the originating parish for the record. The address, email, website, and other contact information for the parish will be included in all responses and it will be strongly suggested that the recipient of the record make a voluntary donation to the parish in honor of his or her ancestors. Researchers using the on-site index in person will still be required to submit requests for record images and pay a small fee for each record. Once the documents for each parish have been transcribed, Nashi Predky will provide free of charge to the originating parish a USB flash drive, DVD-ROM, or other computer media containing all of the digital images of that parish’s records as well as the Excel transcription files so that the parish staff or priest can make use of the digital files to aid in responding to any inquiries that the parish receives directly. This will not only make searching for records quicker and easier, but will also reduce wear-and-tear on fragile original documents and help to preserve them for the future. Our Ukrainian American ancestors have left us a wonderful legacy. Let us preserve it and learn from it before it is too late. The Nashi Predky group is in a position to help parishes to preserve and make accessible their historical records with minimal effort and practically no cost to the parish itself. Our plan balances the importance of ease of access, privacy concerns, and financial concerns. The parish will benefit by having an indexed set of digital images to aid any inquiries it receives directly. Privacy concerns will be safeguarded. The burden on parishes of responding to genealogical requests will be greatly reduced. Parishes can be confident that their records are safe from accidental destruction or damage. The Center will be able to respond to many inquiries, funds will be generated for the Center, and donations to the parishes will be encouraged. Non-genealogical requests will still be directed to the parishes. Finally, researchers will be able to access and study our Ukrainian American history and make connections across families, parishes, and decades as never before. This is a “win-win” situation! Please join our effort so that we can work with you to preserve the historical treasures in your midst.